There a several different ways to treat testicular cancer. Perhaps the most common start is a Orchiectomy. 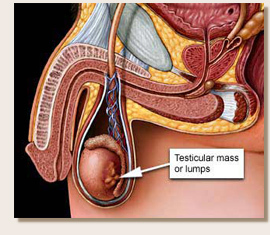 Once removed, the testicle can be analyzed by a clinical pathologist to diagnose the stage of the cancer. The stages are listed below. Other treatment options are Retroperitoneal Lymph Node Dissection, Chemo, Radiation and Surveillance. Treatment depends on what the cancer cells look like under a microscope (cell type). If a tumor called a seminoma is found, treatment will probably be surgery to remove the testis (radical inguinal orchiectomy), followed by external-beam radiation to the lymph nodes in the abdomen. Clinical trials are also being performed on radical inguinal orchiectomy alone followed by careful testing to see if the cancer comes back. Radical inguinal orchiectomy and removal of some of the lymph nodes in the abdomen (lymph node dissection). Patients may undergo surgery that will preserve fertility. Blood tests and chest x-rays must be done once each month for the first year following the operation and at least every 2 months during the second year. A CT scan, a special kind of x-ray, may also be done. If results of the tests don't look normal and the cancer has recurred (come back), the doctor will give the patient systemic chemotherapy as soon as possible. Radical inguinal orchiectomy alone followed by careful testing to see if the cancer comes back. The doctor must check the patient and do blood tests and x-rays every month for 2 years. This option is chosen only if the tumor has certain special features. Treatment depends on what the cancer cells look like under a microscope (cell type). If a tumor called a seminoma is found and the tumor is nonbulky (no lymph nodes can be felt in the abdomen, and no lymph nodes block the ureters [the tubes that carry urine from the kidney to the bladder]), treatment will probably be surgery to remove the testis (radical inguinal orchiectomy). External-beam radiation is then given to the lymph nodes in the abdomen. If a tumor called a seminoma is found and the tumor is bulky (lymph nodes can be felt in the abdomen and/or the lymph nodes block the ureters, or if a CT scan shows them to be large), treatment will probably be a radical inguinal orchiectomy followed by systemic chemotherapy or external-beam radiation therapy. Radical inguinal orchiectomy and removal of the lymph nodes in the abdomen (lymph node dissection). The doctor will check the patient each month and do blood tests, chest x-rays, and CT scans. If the test results are not normal, patients will probably receive systemic chemotherapy. Radical inguinal orchiectomy and lymph node dissection, followed by systemic chemotherapy. Blood tests and chest x-rays must be done once each month for the first year after the operation. CT scans are also done regularly. Radical inguinal orchiectomy followed by systemic chemotherapy. If x-rays following chemotherapy show that cancer remains, surgery may be done to remove the cancer. After the operation, the doctor will check the patient each month and do blood tests, chest x-rays, and CT scans. In some cases, chemotherapy may be given before the radical inguinal orchiectomy. Clinical trials of systemic chemotherapy instead of lymph node dissection (in selected patients). Systemic chemotherapy. Clinical trials are testing new chemotherapy drugs. Systemic chemotherapy, followed by surgery to take out any masses that remain to see if there are any cancer cells left. If cancer cells remain, patients will probably receive more systemic chemotherapy. Clinical trials of systemic chemotherapy. Clinical trials of high-dose systemic chemotherapy with autologous bone marrow transplantation (in some patients). Treatment depends on what the cancer cells look like under a microscope, where the cancer recurred (came back), and other factors. Treatment options include systemic chemotherapy, high-dose systemic chemotherapy with autologous bone marrow transplantation, surgery, and clinical trials testing new chemotherapy drugs.